I took myself away for a few days as I am starting a new job soon and won't get another chance for 12 months. 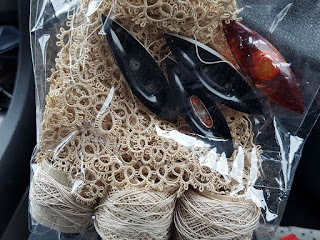 Decided it would be a tatting treasure hunt trip so I hit pretty much every secondhand dealer, opportunity (thrift) shop and antique shop between Shepparton and Warrnambool. All the old towns including Bendigo and Ballarat and ....NOTHING!! On the way home I spotted a sign saying "old wares" on a side road. Nearly missed it. It is one of those places where sellers rent a small space in a big hall. I thought...what the heck. Plenty of time before I have to be home. Got there with 5 minutes to closing. Asked about shuttles, showed them the one I had with me and suddenly a woman pipes up....Oh yes I think the lady down the back has something like that!! My first shuttle find in any of those sorts of stores! The Milwards mean I can keep my promise to Shari to replace the one that never arrived in the mail and have a couple of spares to trade. There was a brown plastic one too, but sadly it was extremely brittle (so was the thread). 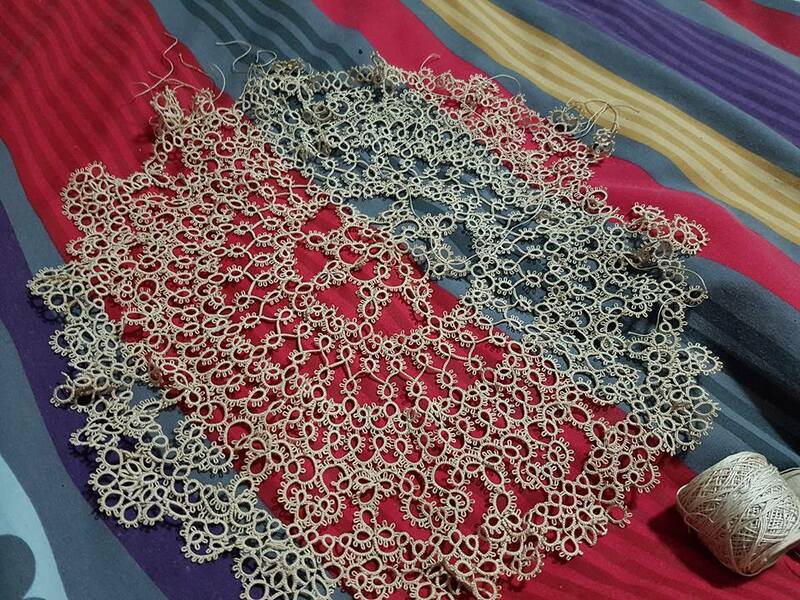 The doily is also really brittle thread and falls apart if you handle it too much. But it has inspired my next doily at least! Good to have you back blogging. Hope the new job goes well. I have the best job in the world. It’s called retirement! Pay is pretty good if you’ve worked hard all your life. Certainly means you can afford thread and beads! Looking forward to that Jane. Might even get some travel in!! But for now I will remain casual and just work when I choose and try to get this blog back on track. Awesome finds. Looking forward to see the doily tatted by you.